The Corps of Military Police (CMP) Old Comrades Association (OCA), the progenitor of the current Association was formed in January 1913, re-formed after the First World War, in 1927 and continued up to the outbreak of war in 1939, when its assets were frozen and the Association was put into abeyance. Members met annually on F.A. Cup Final Day when a Dinner was held in London, followed by a Parade and a march to the Cenotaph, where a wreath would be laid, in memory of fallen comrades. In March 1941, the CMP Old Comrades (War) Association [OCA (War)] was formed to fill the vacuum created by the closure of the OCA. Then, as now, its objectives were to help members in need and to encourage comradeship amongst those serving with CMP. 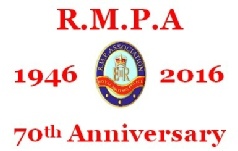 On 15th June 1946 The "Royal Military Police Association" was formed, assuming the responsibilities of the OCA (War) for over 50,000 CMP members, as well as for veterans who had served in CMP and its forebears prior to 1939. On the 16th June 1946 the Depot Branch of the Association was formed in The WOs & Sgts Mess, Inkerman Barracks, Woking and despite changes of Depot locations the Depot Branch has remained active. The Royal Military Police Association today has some thirty-nine (39) active Branches across the UK, Republic of Ireland, Cyprus, Australasia and North America, with more than 2,500 active members, from a total membership of approximately 16,500. All serving members of RMP become Life Members when they have completed their Phase 2 Training and receive their Warrant Card as fully fledged Service Police Officers. In the same way that the OCA did from 1913, the RMPA meets collectively, once each year for its Annual Re-Union Week-end. Individual Branches however, meet much more frequently. Though today, in a time when 'Social Media' is becoming the preferred method for keeping in-touch with friends and former comrades, recruiting for branches has become so much more difficult. As a result many branches now have vibrant, attractive and informative, websites which are being used as the tool of choice to attract new members. The work of the Royal Military Police Association remains exactly as it was when the original Old Comrades Association was formed over 100 years ago: to help the needy; raising money for the Corps Benevolent Fund; and engendering 'esprit de corps', while maintaining the exclusive friendliness that remains the hallmark of the Royal Military Police.